Last summer the horror flick The Purge was a surprise hit. Just one year later the sequel, The Purge: Anarchy, is already in theaters. Sometimes it’s best to strike while the iron is hot and judging by a strong opening weekend, the right choice was made in rushing out the second installment. But strong opening weekends don’t necessarily mean good movies, and this one isn’t. This film all but abandons the clever satire that made the first film distinctive in favor of escalating death scenes that only provide the most base level of thrills. 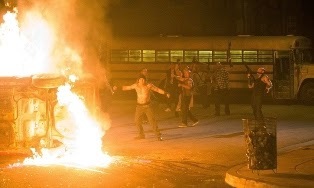 Unlike the first film, which centered on a single family trying to survive the annual purge as their elaborate security system begins to fail, Anarchy takes the mayhem out into the streets as a group of unwilling participants try to survive the night in downtown Los Angeles. 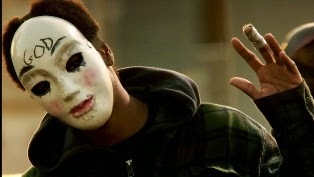 While I liked the idea that this film attempted to expand the concept by showing more of what goes on during the Annual Purge, I was disappointed that once the core group of characters were introduced, the film devolved into a basic “stay one step ahead of the bad guys” chase movie. The plot is fairly basic. 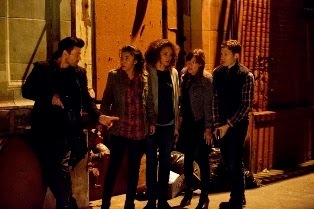 In typical horror movie fashion a group of strangers bands together to fight a common enemy. First we have Shane (Zach Gilford) and Liz (Kiele Sanchez) a young couple whose car breaks down in the middle of the city just before the Purge commences. 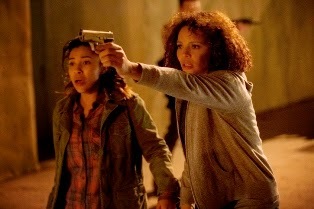 They eventually meet up with Eva (Carmen Ejogo) and her teenage daughter Cali (Zoe Soul) who have just been rescued from being purged by the mysterious Leo Barnes (Frank Grillo). Once these characters meet, plot and character development pretty much ends. While the intro of each of these characters was interesting enough, once they are together nothing interesting about them or the Purge itself materializes. Early on the film introduces a few interesting concepts, like the real role of the government in the Purge, a growing resistance movement, and the buying and selling of potential Purge victims by the wealthy. But sadly, these are just concepts left as part of the backdrop rather than being explored in any thoughtful, significant way. In the end this film falls into the trap of lazy storytelling. By the time the film reached the half way point I was growing tired of the concept. At the very least I hoped for some kind of twist that would change things up, but that never arrived. While there is a good chance we will see a Purge 3 in theaters (probably in a year, as promised before the credits roll), I can’t say I’ll be waiting with anticipation for it.